This is ten-year-old Reilly Aloysius Johnson. 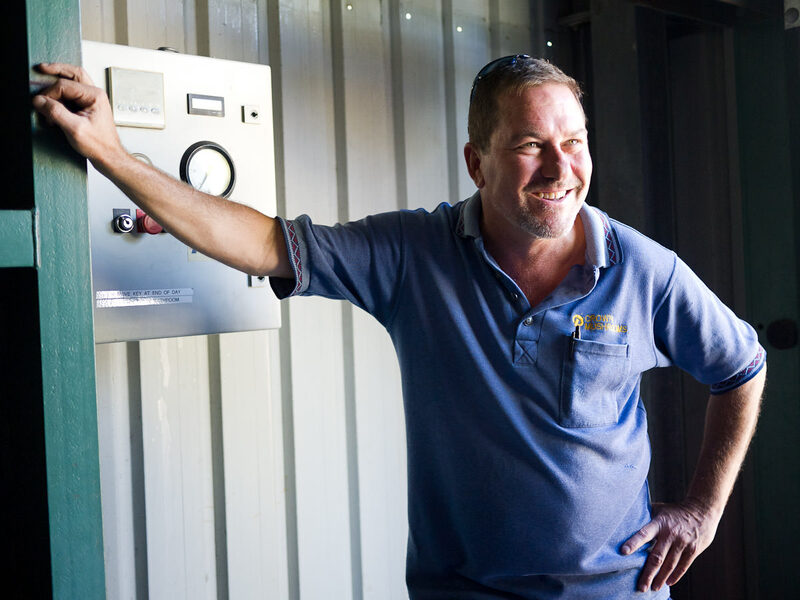 He goes to work with his dad Scott Johnson every day, at Crown Mushroom Farm in Wanneroo. 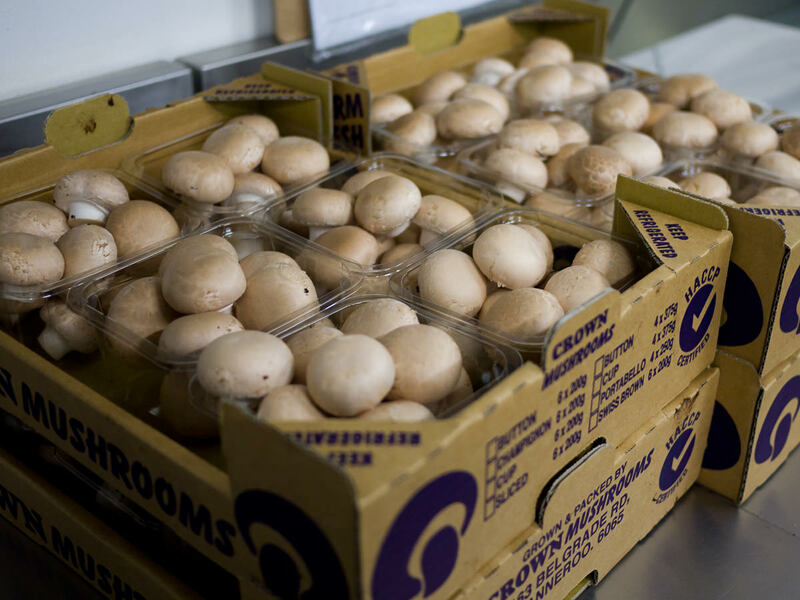 Established in 1972 and still owned and run by the Johnson family, Crown Mushrooms is Western Australia’s largest locally owned mushroom farm, producing 25 to 30 tonnes of fresh mushrooms every week. Considering that the average mushroom is around 40 grams, that’s a mind-boggling lot of mushrooms. 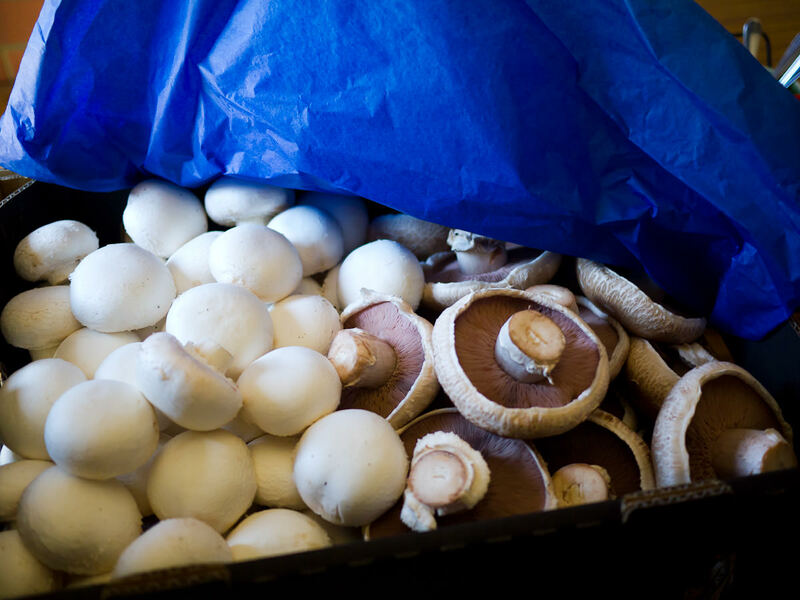 Last year I attended the Australian Mushroom Growers Association annual lunch, organised by Noelene of Fresh Finesse. At lunch, I expressed an interest in learning more about mushroom farming/production, as did a number of the chefs in attendance. 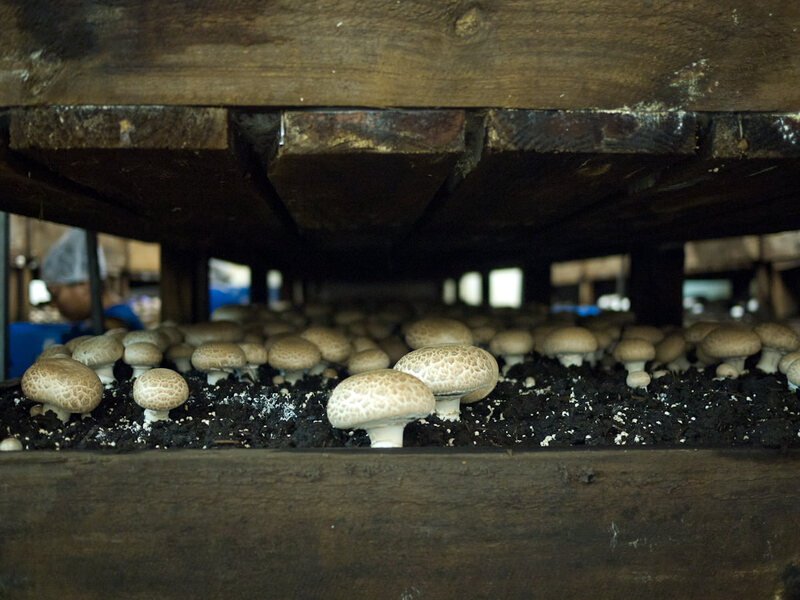 As a result of that conversation, Noelene organised this tour of a mushroom farm. Scott Johnson, son of Crown Mushrooms founder Trevor Johnson, is our tour guide this morning. 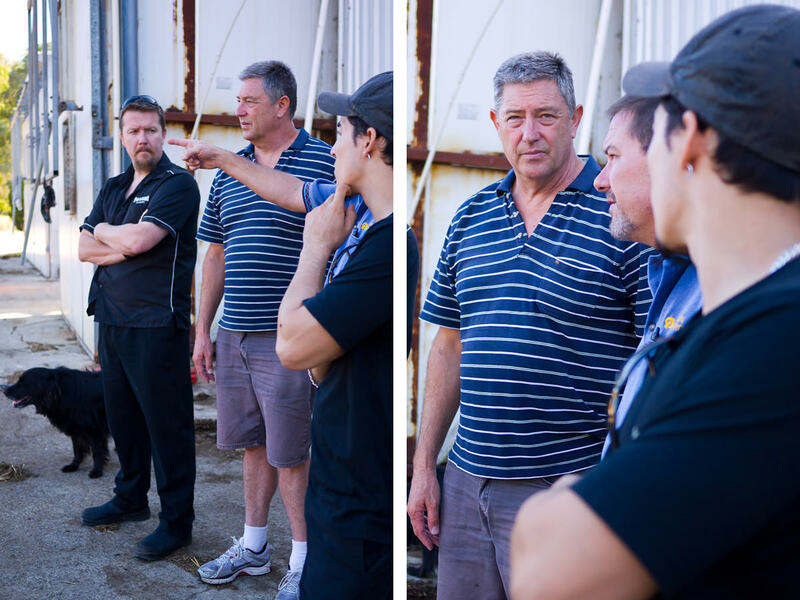 Noelene, chefs Nik, Don and Carl from Panorama Catering and I follow Scott as he shows us around the property and tells us all about how mushrooms are grown. 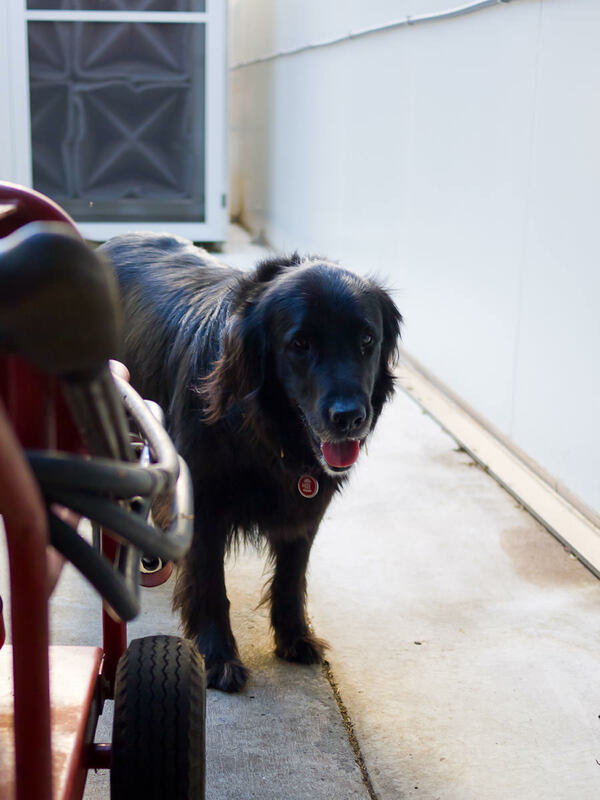 Reilly Aloysius quietly trudges along with us, tail wagging. 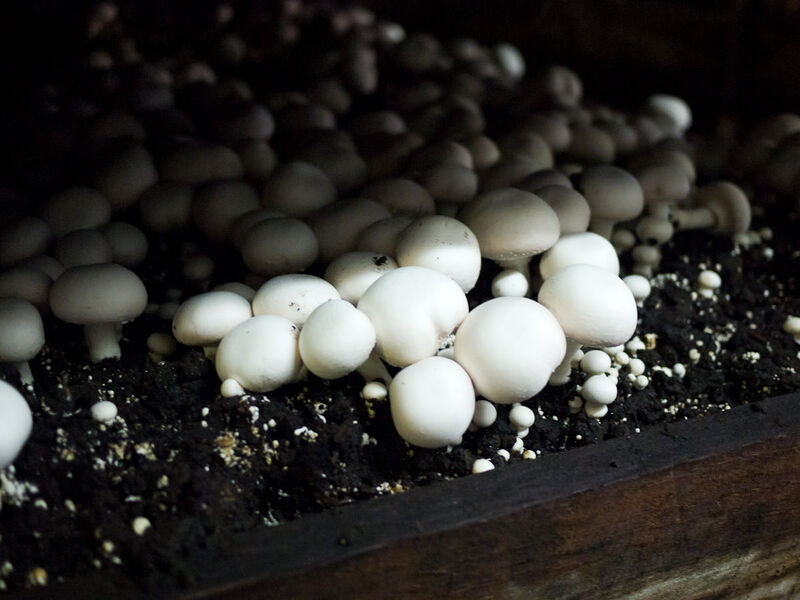 Mushrooms don’t need sunlight to grow – they get everything they need out of the soil and so good compost is a crucial ingredient if they are to thrive. 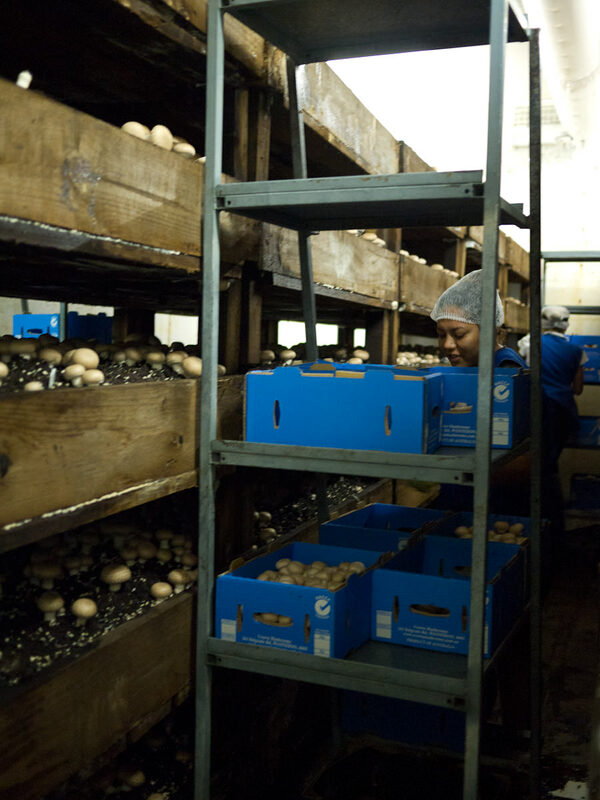 140 tonnes of compost is produced here at the farm every week, used for growing mushrooms. 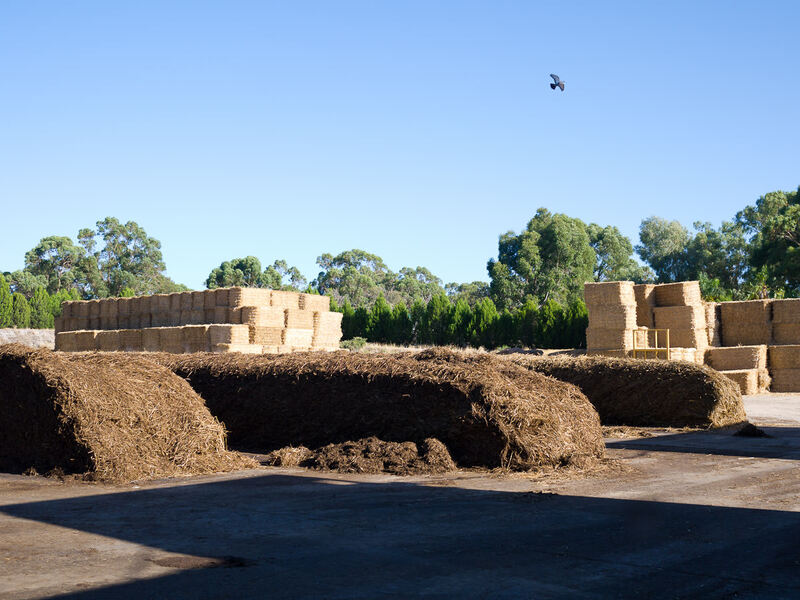 The mushroom compost is made using straw and poultry manure. 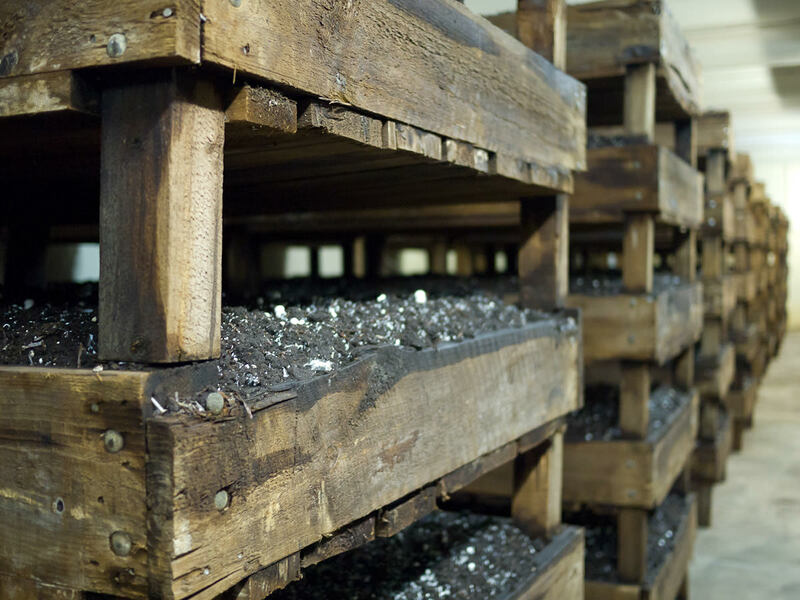 At every step of the process, the compost is carefully monitored to ensure pH, moisture and various elements are at the correct levels. 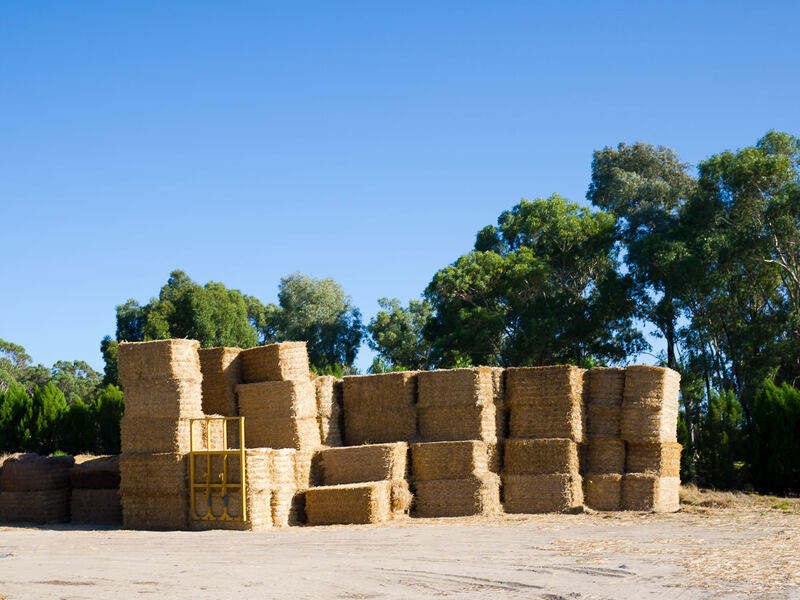 The compost is pasteurised over 7 days to kill off any bad bacteria. 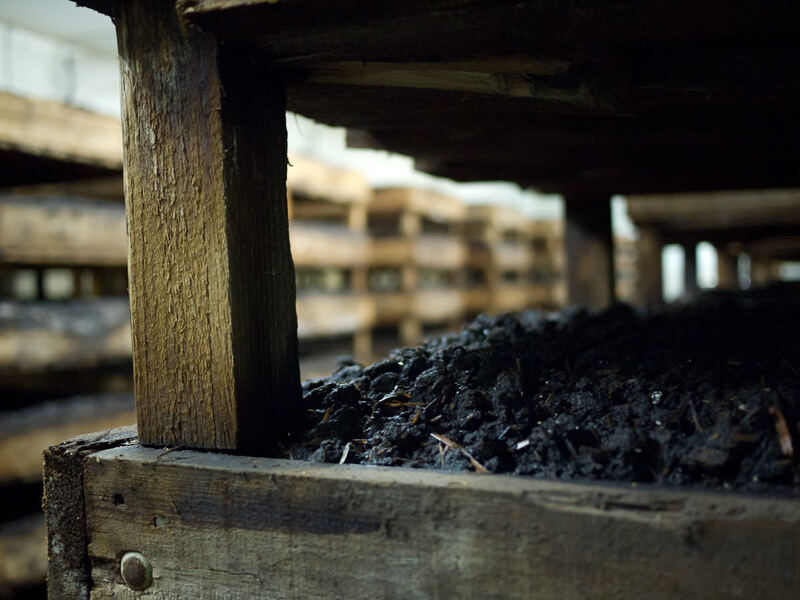 By the end of the process, it smells quite sweet – not at all like the manure it was made from. 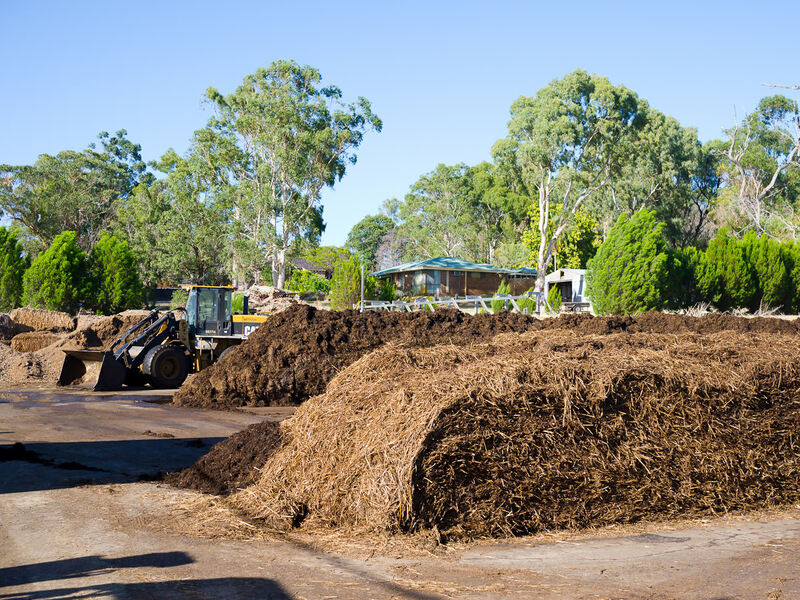 Scott reflects on how much the production of compost has evolved over the years to a process that incorporates precise, scientific methods and automatic watering. When he was a boy, one of his much-loathed after school chores used to be watering compost by hand with a hose. Scott also tells us that the spent mushroom compost is sold to gardening shops/nurseries and can be used as a mulch or to enrich soil. It’s particularly good on vegetable gardens, roses and palms, he says; not so good with camelias and azaleas (something to do with acid levels – I’m no gardener). 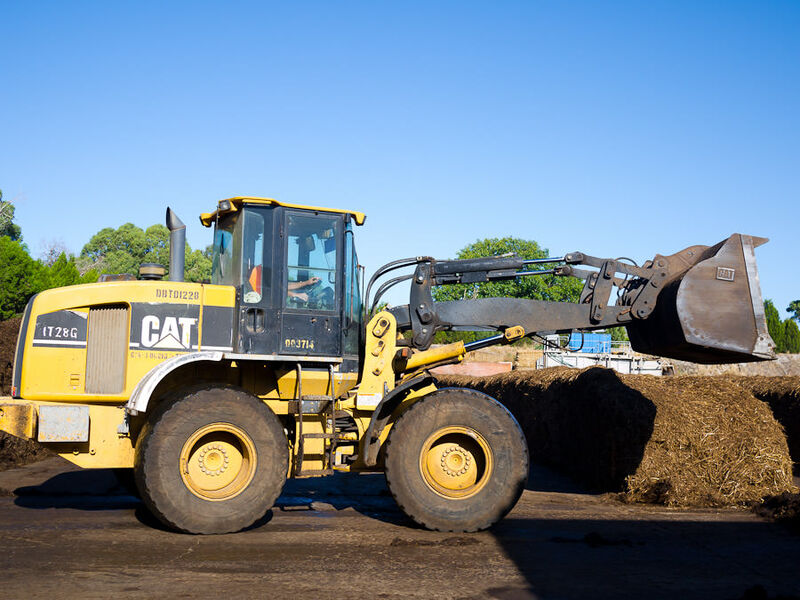 Making mushroom compost – Jac would love to drive one of these front end loaders. Crown grows white and portobello (also known as Swiss brown or cremini) mushrooms. 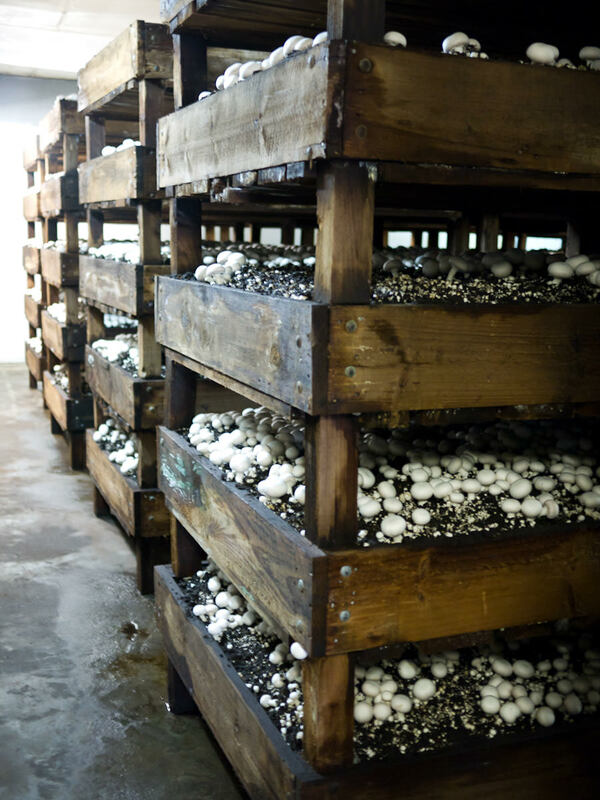 The mushrooms are grown all year round and harvested and sold in four stages of growth – as champignons, buttons, cups and flat (also called field) mushrooms. 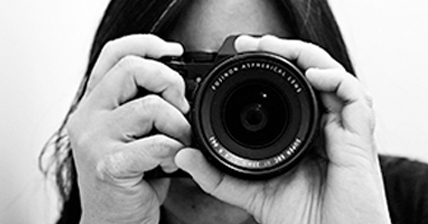 It’s a modern and high-tech production process developed and perfected from years of research and experience. State-of-the-art climate control technology is used to ensure optimal environmental conditions are monitored and maintained. 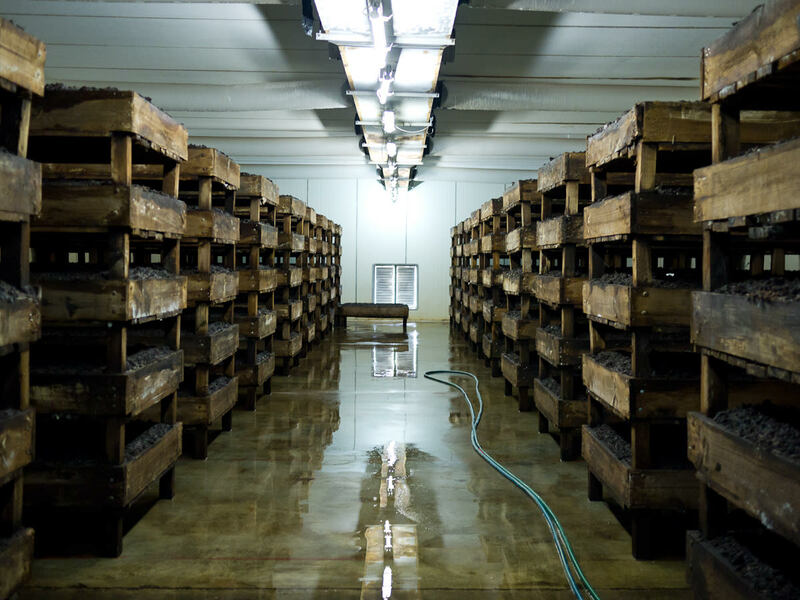 The temperature, humidity and pH levels in these mushroom growing beds determine when the mushrooms get to “fruiting” stage, and then have a direct bearing on the size and number of mushrooms that will be produced. In all of these rooms where the mushrooms grow, there is a wonderful smell of wood and moist earth… forest. It’s very still and quiet here. I feel like I should be tip-toeing. 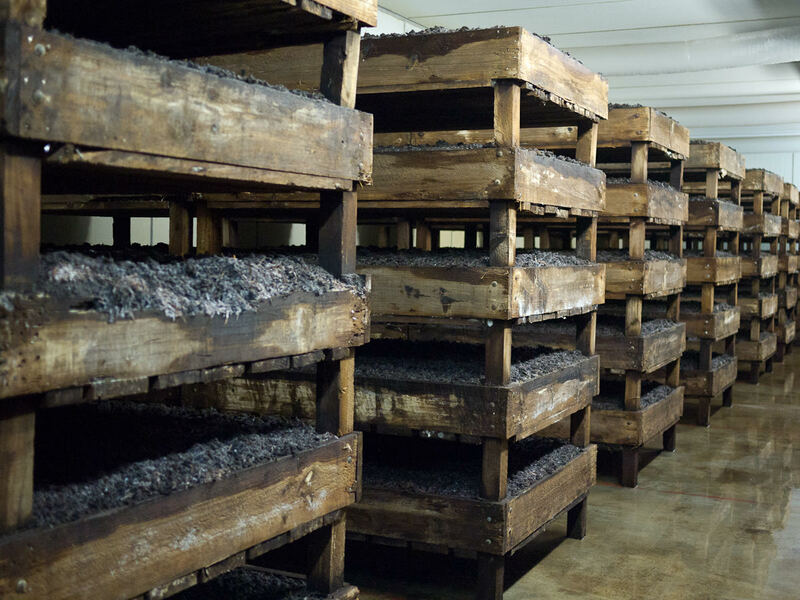 We visit a number of rooms, each with mushrooms at different stages of growth. 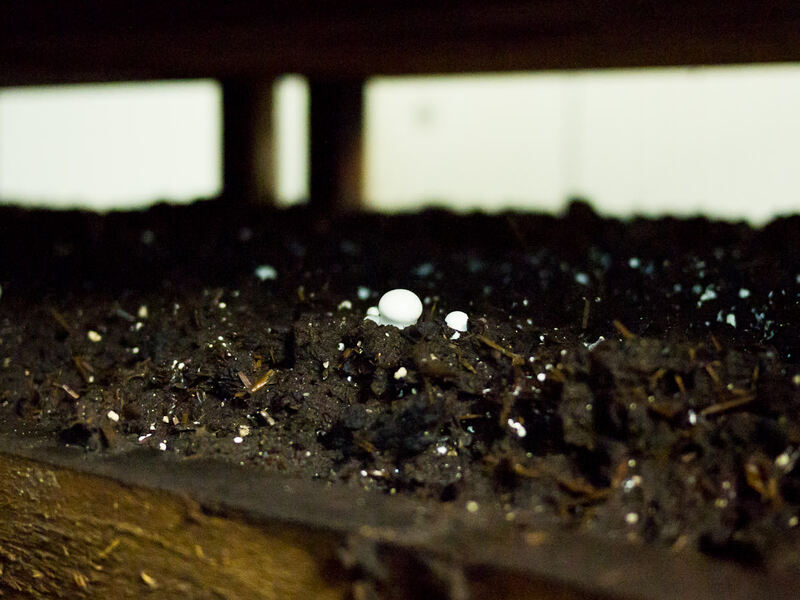 In the first room, the mushrooms are barely visible, so I’m excited to see finally little white button mushrooms peeping through the soil, like twinkling stars in a night sky. The lights are left off when there’s no one in the rooms, but Scott flicks them on so we can see and photograph the mushrooms better. I love the sight of the tiny baby mushrooms peppering the soil, but I’m really keen to see mushrooms that are ready for picking. This is a thrilling sight. 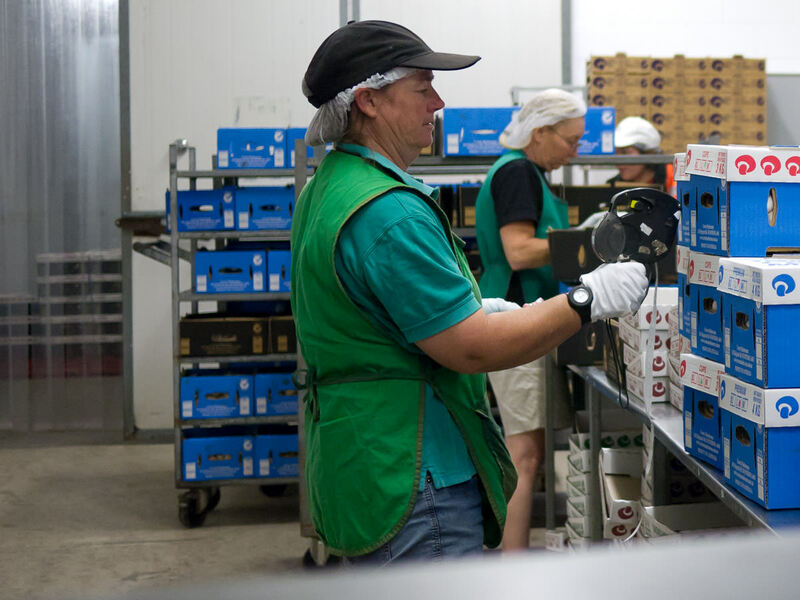 There’s movement in among the mushroom beds – mushroom pickers quietly working, harvesting and sorting mushrooms. 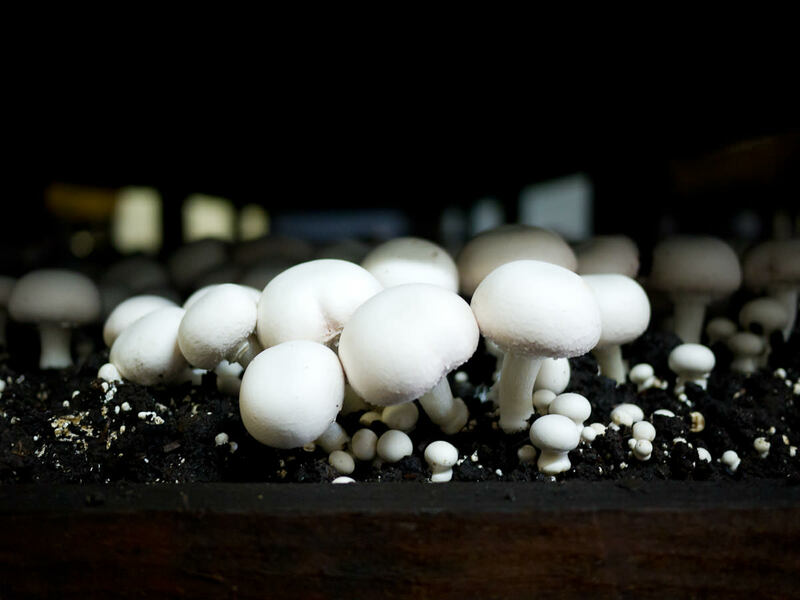 Scott tells us it takes three months training and experience before a mushroom picker truly gets up to speed, picking and correctly grading approximately 30kg of mushrooms per hour. I could stay here for a long time, just enjoying the smells and taking photographs of mushrooms. I really feel like eating mushrooms now. 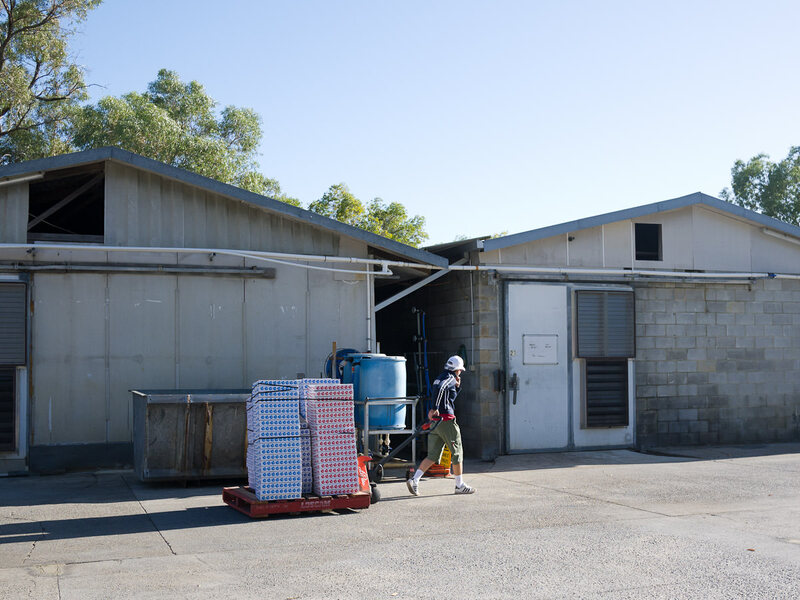 We leave the mushroom growing rooms (me, somewhat reluctantly) to check out the packing area. Finally, we assemble in the tea room where Scott and his staff give us fresh mushrooms to take away. 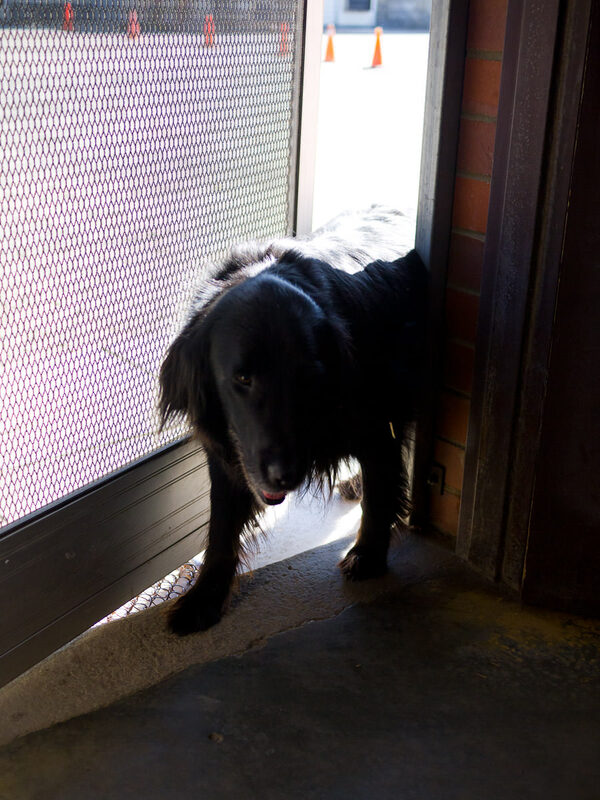 Reilly Aloysius pops in to say hello and good-bye. Thank you to Noelene for organising the excursion and to Scott for taking the time to show us around the farm. The tour of the mushroom farm was a great way to start a day, but it was off to work for me afterwards. 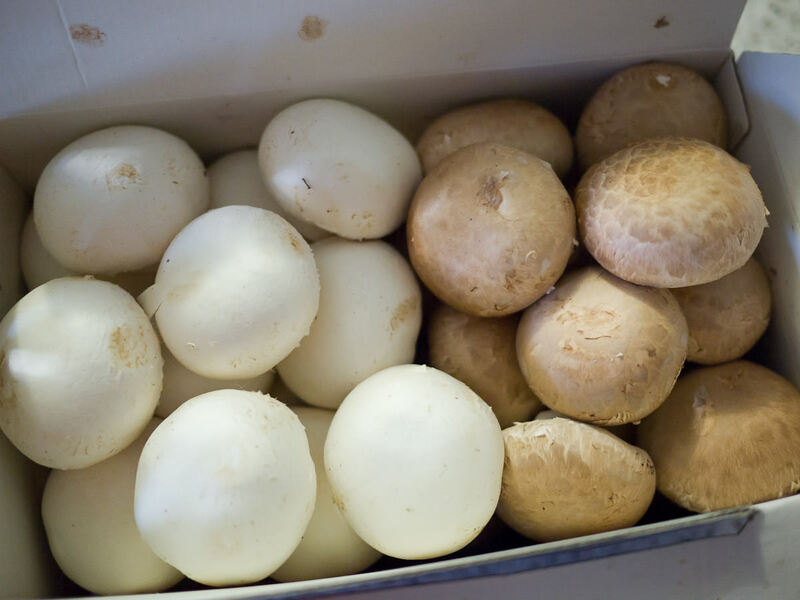 Just look at the beautiful white and portobello button mushrooms Crown Mushrooms gave me! My work colleagues were intrigued and a little jealous! 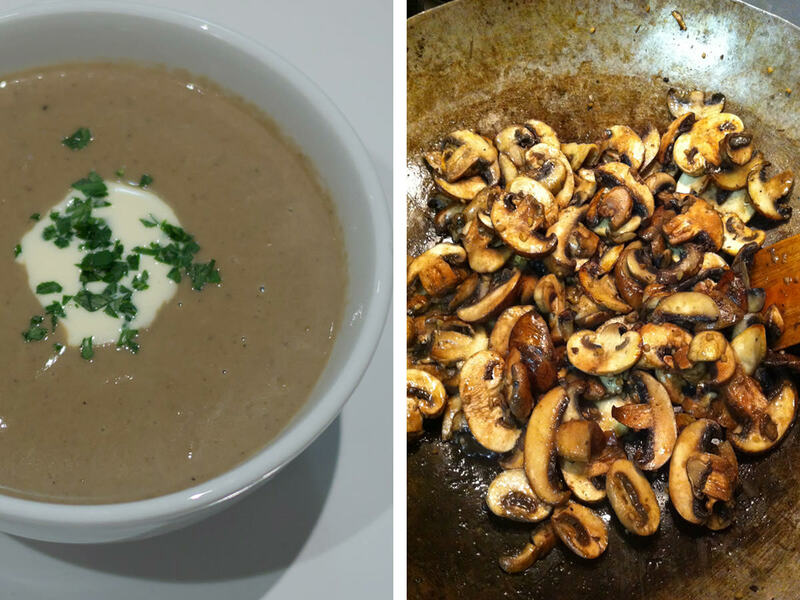 Jac made a delicious mushroom soup which we ate with fresh crusty bread and butter. On another night, she fried the rest of the mushrooms with garlic and butter, which we enjoyed with beef sausages and pan-fried tomatoes. What’s your favourite way to eat mushrooms?